Today we took some trees down, it was trully a Laurel and Hardy act out there with Tim and I at the helm. Thank goodness my friend Joe from the Community Gardens came by and helped us as we were just getting ready to take out one of our bee hives. The gang however, enjoyed a wonderful snack of beech buds, hemlock branches and whatever else we took down. Note to self, we are not tree guys! 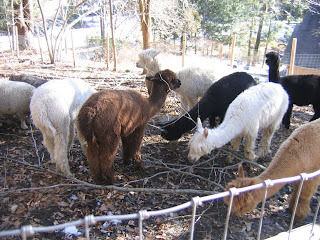 Free to a Good Home...Alpaca Manure!! !